The Economy Today is noted for three great strengths: readability, policy orientation, and effective pedagogy. The accessible writing style engages students and brings the excitement of domestic and global economic news into the classroom. 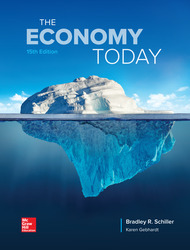 The Economy Today, 15th edition, is thoroughly integrated with adaptive digital tools and dynamic interactive resources available in Connect--proven to increase student engagement and success. Chapter 10: Self-Adjustment or Instability? Chapter 27: Natural Monopolies: (De)regulation?